The Story: Photographing spawning fish has been a passion of mine for a decade now and this single image took me nearly seven years to capture. In Palau, camouflage groupers only spawn once or twice a year for only one or two days. As you can imagine it can take a while to figure the exact timing out. Each passing year I slowly worked away at the formula, ticking off each tidal prediction as it came and went. I never however expected this species to spawn in the middle of the night which is one of the reasons it took me so long and was quite possibly the last time I was willing to sit all night watching groupers do nothing again. That night I found a female grouper that I knew was moments away from spawning, I positioned myself a little distance back from her and watched as the male grouper wisely guarded her against a rock with the ever increasing numbers of sharks patrolling the perimeter of the channel, I knew the showdown was finally approaching. 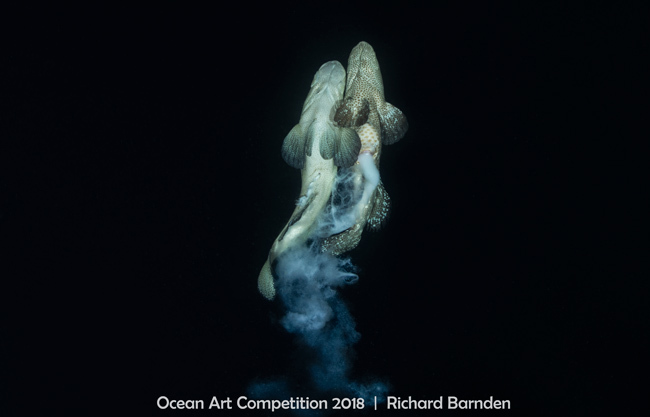 Suddenly the male grouper nudged his partner up and out of the hole and like a deflating balloon they spiraled towards the surface releasing their gametes as I fired away. It was all over in a split second, the question was did I get anything?